Any day now we will officially launch our campaign telling all employees they can use the intranet in every device, in every place. The intranet has been accessible with the help of VPN for several years. But VPN is difficult to install in the device and troublesome to switch on and off in a device. And in City of Malmö VPN also has an internal price tag of €100/year due to a bad license contract with the supplier. But soon, no more of that! The new solution is a reverse proxy from the vendor Nexus, called Portwise Access manager. 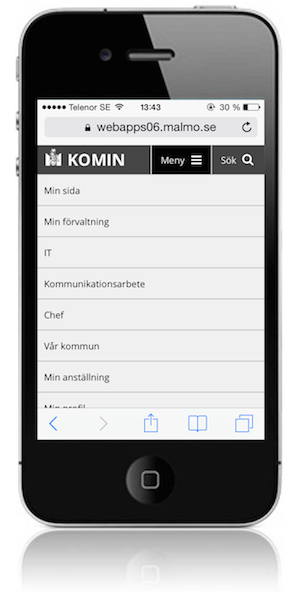 When you try to reach the intranet in a device you use the ordinary address http://komin.malmo.se. If you are inside the firewall you get the intranet immediately. If you are on the outside you get a login page. On that page the user provides the standard username and password that is used with 95 percent of the systems in City of Malmö. When done, boom, the intranet is shown! Links from the intranet to other systems and databases works if the system/database is connected to the Portwise Access Manager, because the PAM is a Single Sign On solution. The login page. One thing to do and below help info about what to do if your password does not work. The intranet front page. Personalized dashboard. Responsive, of course! Runs on Ruby on Rails and is shared as open source. A news page. This is an interview with a person called Martin Regnell. News runs on WordPress and our build is shared as open source. The wiki section on the intranet. Runs on Mediawiki. This one is also open sourced. A blog post by a colleague. A click on his name takes me to his other blog posts or his staff directory page. WordPress is the tool for our blog and our build is shared as open source, of course. A staff directory page. If i click on the phone number my iPhone asks me if I want to phone him. A bit further down Anders visiting address is clickable, exposing a map. Oh, and did I mention Anders can be on this page, edit his data AND change the profile picture using the camera in his phone? 🙂 The Staff Directory runs on Ruby on Rails with heavy data connections to the dashboard and the central City of Malmö Active Directory. Open sourced? Yes. Forum section, today in the final stages of RWD development. Runs on Drupal. Soon to be open sourced. Masthead search drop down. Employee search runs on Elastic on top of Lucine. The employee search has fuzzy search (misspell and you still get a hit) and has real-time search (change your data and it shows up in search results a second later). Open sourced. Masthead menu drop down. The masthead is a part of the central asset and open sourced. Example of a page that is not RWD today. Ugh! Will be rectified this autumn! We wants it, we needs it. Must have RWD.